It's a difficult balance: being cautious about what you eat and enjoying your trip to China. On the one hand, you don't want to be wiping every utensil with hand sanitizer every time you sit down. On the other hand, you don't want to throw caution to the wind and end up curled in the fetal position in your hotel room wishing you'd remembered to bring some Pepto-Bismol. Not to worry, read these helpful tips and you should be well prepared to enjoy your trip - both visual and culinary - to China. Hotels will provide guests with bottled water (free) for drinking and brushing teeth. In larger hotels, there may be a little sign in the bathroom that reads something along the lines of "tap water not potable," but don't take the absence of this notice as an indication that tap water is safe to drink. Nowhere in China is it advisable to drink tap water without boiling it first. Most restaurants will have some bottled water on the menu. In some cases, it might be quite expensive such as Evian or San Pellegrino, and these types of imported mineral waters are considerably pricey even outside restaurants. There are a number of ways you can ask for free water from the establishment. See next item. he shui, pronounced "huh shway", is drinking water and it will likely be served hot or warm as Chinese believe it is unhealthy to drink cold water. You won't have to go far to find bottled water that is safe to drink. In China, there are convenience stores everywhere and if you can't find one, there are drink stalls on many street corners no matter how small the city. In convenience stores, you may be able to find Evian or imported brands, but the cheapest options are Chinese bottled waters. Even some of these will look familiar as Coca-Cola and other international companies have operations bottling water in China. Make sure the cap seal is intact if you are buying from a suspicious looking vendor. I have to admit, here I err on the side of the somewhat-reckless (in the eyes of some) and it may be due to the fact that while I've had several bouts of terrible food poisoning since moving to China, I can point the instances back to 1) airline (United) food, 2) fancy hotel buffet and 3) fancy restaurant dining, not suspicious street food. The general rule is if the food has been standing out for a while, wasn't cooked well, isn't fresh or could have been washed in contaminated water, try to avoid it. Of course, you don't always know the circumstances of the preparation of your food so see below for more tips. Street food in China is really something to sample and it would be a shame if you passed it for fear of getting sick. Street food is usually some of the freshest available. The vendors prepare it quickly, while you wait, so you don't have to worry about it sitting out in the heat. On many food streets, you'll see lines of folks queuing for snacks and this is generally a very good sign that the stall has a good reputation. You may want to avoid meat snacks in the height of summer and snacks that include anything raw. But dumplings, pancakes, and fried anything are fair game. Chinese believe fresh is best so you'll often find the waiter approaching you with a wriggling plastic bag containing the fish you ordered so you can see the specimen before it arrives at your table poached in black bean sauce. This doesn't happen in all restaurants nor with all orders. (I'd hate to have to give a nod to the Sichuan beef I just ordered.) The general rule with restaurants is to try recommendations, or without those, places that look busy. Even if you're the most cautious of vigilant diners, you'll still enjoy eating and drinking in China. 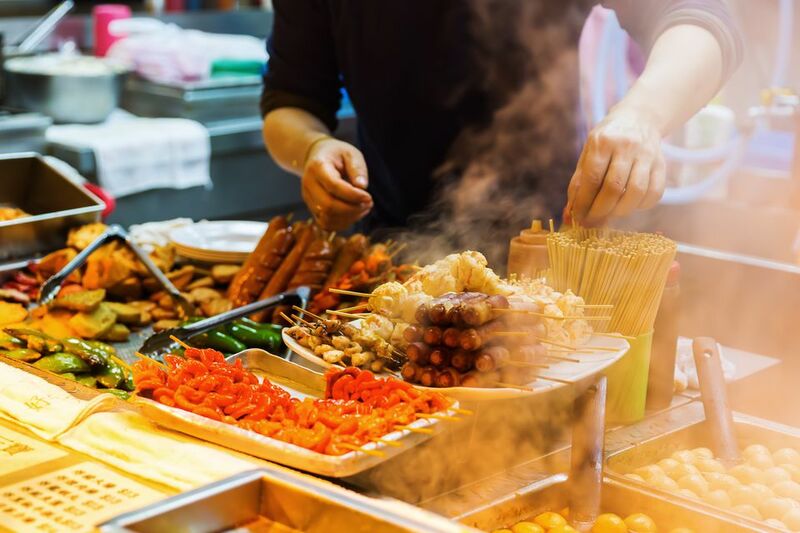 Even the tamest of foreigner-friendly Chinese restaurants have delicious food and you'll experience dishes and flavors that you've never come across before back home. But hopefully, you'll be safe and a bit adventurous and have a culinary adventure during your visit to China.